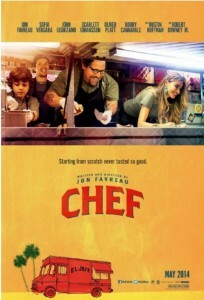 Though I’m late to the party, I’m thrilled to have discovered Jon Favreau’s fabulous film, CHEF. A sleeper hit when it was released in May on a modest budget with no marketing to speak of, CHEF gained traction solely by word of mouth and social media and is now having a successful second life on DVD. There is so much that CHEF gets right. Favreau, who also wrote and directed, plays Carl Casper, a man forced to reinvent himself after a career crisis as he chooses between being an occasional father or having a genuine relationship with his son. His odyssey from tony Los Angeles chef to food truck entrepreneur is touching, funny and a feast for the senses. I couldn’t get the smile off my face watching this movie, wiping away more than a few tears in the process. CHEF doesn’t rely on gimmicks and illuminates not only the importance of family and intimacy but the deep satisfaction derived from loving one’s work, even when the picture your life paints is not what you had planned. The film is refreshingly positive. The characters are not bitchy or backstabbing for no reason. No one is over the top. Instead we are treated to lovely performances by Sofia Vergara, John Leguizamo, Bobby Cannavale, Emjay Anthony, Scarlett Johansson, Oliver Platt and Favreau himself. Watching this slice of life unfold turns out to be a lot more rewarding than much of the explosion-filled fare we are fed in movies today. Click and rent CHEF. You’ll be glad you did.